insEYEte | Get down to business. 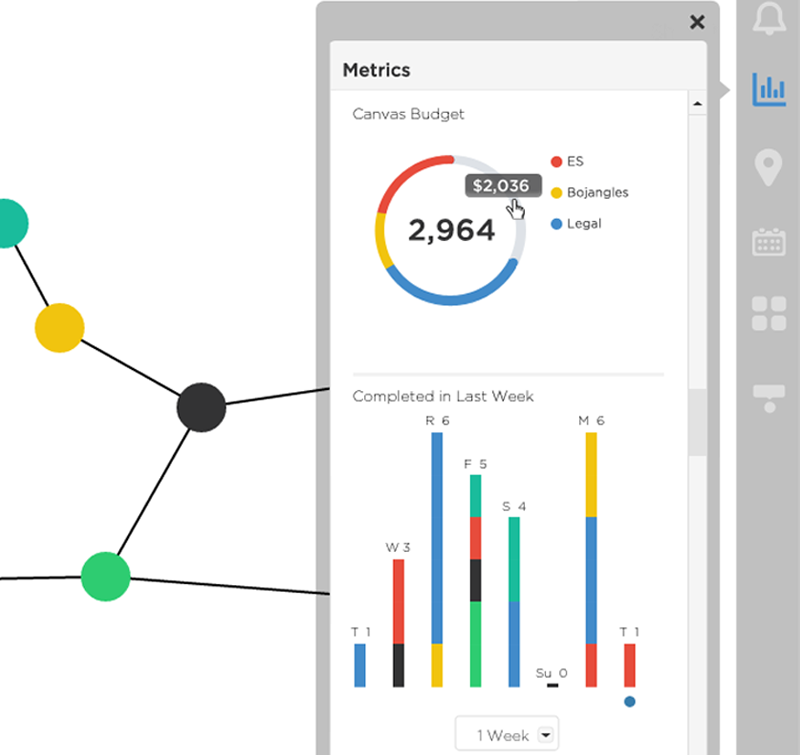 A modern, visual project management tool. Organize projects the way you think. insEYEte empowers you to organize your projects the way you want. Work on multiple projects in one place, and move seamlessly from one task to the next. Traditional project management tools are clunky and boring. Break the mold with insEYEte and use the familiar visual of a mind map to make planning intuitive. Everything you need to take your idea from a brainstorm to the boardroom. From discovery to execution, insEYEte helps you look good while getting the job done. Project Management has never looked THIS good. Create an Atom and begin your journey. insEYEte gives you a powerful set of features to manage the files, tasks, contacts, and budget information relevant to your projects. 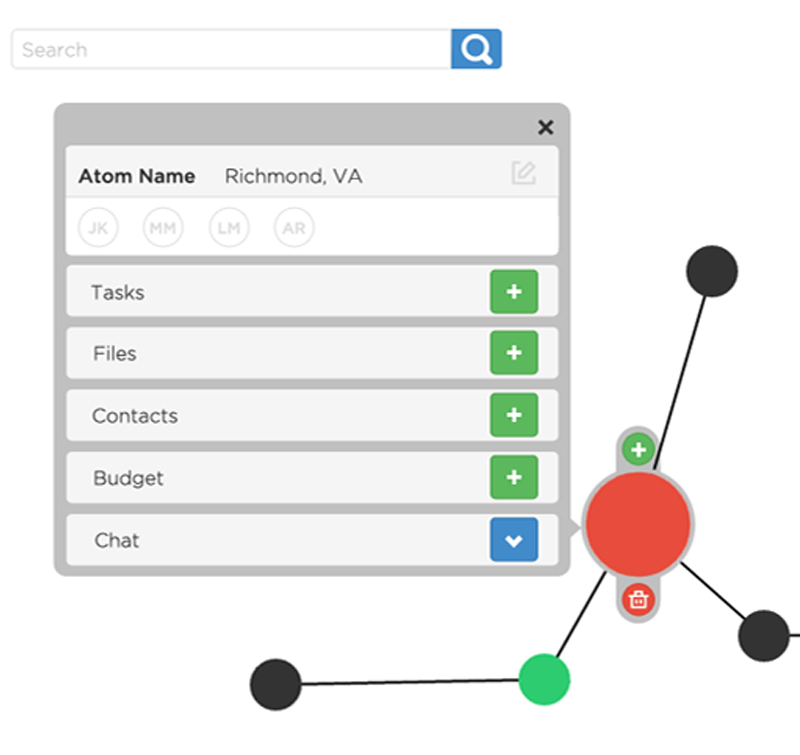 Atoms can represent whatever you want, and can be shared with other users as needed. insEYEte began as an internal project management tool for our development firm. We wanted a tool that could manage multiple projects while limiting a reliance on email. The tool also had to be versatile and intuitive because we work with a variety of clients. As far as inspiration goes, the "internet of things" is an idea that resonates with us. Having the ability to control your environment from your phone. I mean, wow! 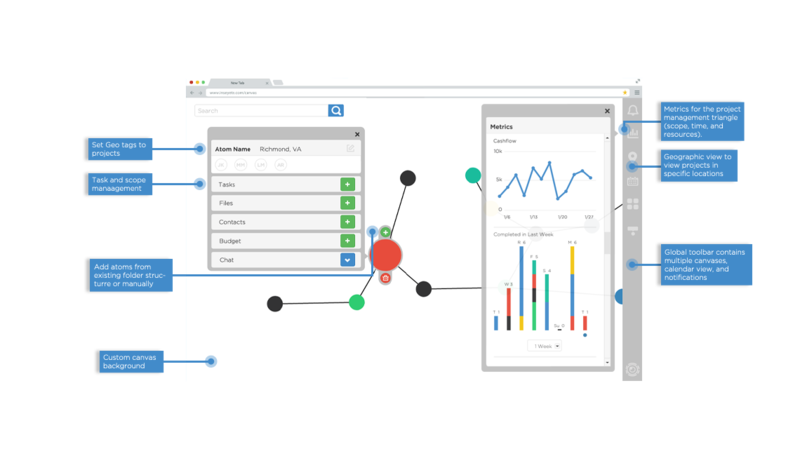 insEYEte’s data visualization tools are meant to optimize the work experience. By understanding the moving pieces (scope, timeline, and resources) of your project you’ll gain insights on how to manage them better. The mind map visual was something that came somewhat naturally to us, as it was how we began every project, starting big and focusing in small. 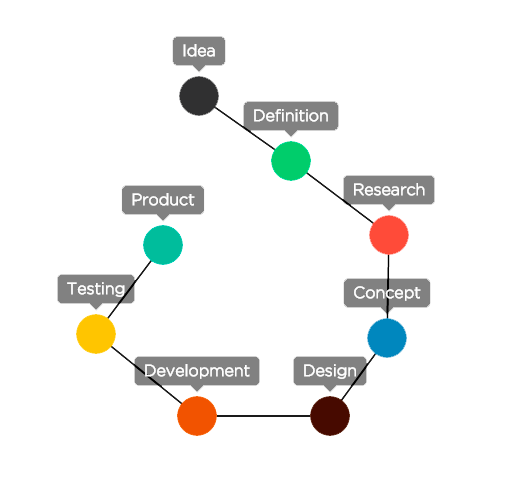 The mind map is our way of incorporating non-linear thinking into the project management space. For more on non-linear thinking check out this blog post. We have three packages for insEYEte, crafted for the size of your team. For custom builds or student discounts, please contact us via email! Questions? Comments? Funny Cat Videos? Send us an email and we'll get back to you as soon as we can. Meet insEYEte! from insEYEte Team on Vimeo. By using the inseyete.com (“Service”), a service of Elegant Solutions Design, LLC (“ES”), you are agreeing to be bound by the following terms and conditions (“Terms of Service”). ES reserves the right to update and change the Terms of Service from time to time without notice. Any new features that augment or enhance the current Service, including the release of new tools and resources, shall be subject to the Terms of Service. Continued use of the Service after any such changes shall constitute your consent to such changes. You can review the most current version of the Terms of Service at any time at: https://inseyete.com/terms. Violation of any of the terms below will result in the termination of your Account. While ES prohibits such conduct and Content on the Service, you understand and agree that ES cannot be responsible for the Content posted on the Service and you nonetheless may be exposed to such materials. You agree to use the Service at your own risk. You are responsible for maintaining the security of your account and password. ES cannot and will not be liable for any loss or damage from your failure to comply with this security obligation. ES reserves the right at any time and from time to time to modify or discontinue, temporarily or permanently, the Service (or any part thereof) with or without notice. Prices of all Services, including but not limited to monthly subscription plan fees to the Service, are subject to change upon 30 days notice from us. Such notice may be provided at any time by posting the changes to the insEYEte site (insEYEte.com) or the Service itself. ES shall not be liable to you or to any third party for any modification, price change, suspension or discontinuance of the Service. ES does not pre-screen Content, but ES and its designee have the right (but not the obligation) in their sole discretion to refuse or remove any Content that is available via the Service. The look and feel of the Service is Copyright © 2011-2013 Elegant Solutions Design, LLC. All rights reserved. You may not duplicate, copy, or reuse any portion of the HTML/CSS or visual design elements without express written permission from ES. Technical support is only available via email at support@inseyete.com. Please allow 48 hours for a response. You understand that ES uses third party vendors and hosting partners to provide the necessary hardware, software, networking, storage, and related technology required to run the Service. You must not modify, adapt or hack the Service or modify another website so as to falsely imply that it is associated with the Service, ES, or any other ES service. You agree not to reproduce, duplicate, copy, sell, resell or exploit any portion of the Service, use of the Service, or access to the Service without the express written permission by ES. You understand that the technical processing and transmission of the Service, including your Content, may be transferred unencrypted and involve (a) transmissions over various networks and (b) changes to conform and adapt to technical requirements of connecting networks or devices. If your bandwidth usage exceeds 300 MB/month, or significantly exceeds the average bandwidth usage (as determined solely by ES) of other insEYEte customers, we reserve the right to immediately disable your account or throttle your file hosting until you can reduce your bandwidth consumption. ES does not warrant that (i) the service will meet your specific requirements, (ii) the service will be uninterrupted, timely, secure, or error-free, (iii) the results that may be obtained from the use of the service will be accurate or reliable, (iv) the quality of any products, services, information, or other material purchased or obtained by you through the service will meet your expectations, and (v) any errors in the Service will be corrected. You expressly understand and agree that ES shall not be liable for any direct, indirect, incidental, special, consequential or exemplary damages, including but not limited to, damages for loss of profits, goodwill, use, data or other intangible losses (even if ES has been advised of the possibility of such damages), resulting from: (i) the use or the inability to use the service; (ii) the cost of procurement of substitute goods and services resulting from any goods, data, information or services purchased or obtained or messages received or transactions entered into through or from the service; (iii) unauthorized access to or alteration of your transmissions or data; (iv) statements or conduct of any third party on the service; (v) or any other matter relating to the service. The failure of ES to exercise or enforce any right or provision of the Terms of Service shall not constitute a waiver of such right or provision. The Terms of Service constitutes the entire agreement between you and ES and govern your use of the Service, superceding any prior agreements between you and ES (including, but not limited to, any prior versions of the Terms of Service). Questions about the Terms of Service should be sent to support at elegantsolutionsdesign dot com.